Central idea: Wake up and prepare to meet Christ. Doctrine: The cardinal virtues. Practical application: Daily examination of conscience. To view the Lectionary readings (§1), click here. The prophet Isaiah foretells the future: God will dwell with his Chosen People. All nations recognize this, Gentiles stream to Jerusalem on pilgrimage, and the world enjoys universal peace. This prophecy is now fulfilled in Christ and in the Church Triumphant in Heaven. It will be universally fulfilled at Christ’s Second Coming. 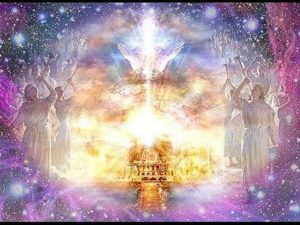 This good and glorious future is why we should redouble our efforts to “walk in the light of the Lord!” so as to be faithful to the Lord and Messiah, Jesus Christ. For us Christians, Jerusalem and its Temple represents heaven and Christ. This is the true home we have always been seeking. The expectation of all the redeemed, living together with Christ in peace, with the fullness of goodness, truth, beauty, and love, should give us joy. Echoing our Lord’s warning to stay awake and be prepared for judgment, St. Paul admonishes us to wake from sleep. It is a good part of our human nature to find pleasure in eating and drinking, in intimacy, and in being esteemed by others. There are legitimate ways our natural desires can be satisfied. But due to the wound of original sin, we are as likely to pursue them through gluttony, drunkenness, lust, rivalry, and jealousy. To put on the armor of light is to pursue a life of virtue. Temperance, for example, is the power to hold back from pleasures that would be sinful, like gluttony, drunkenness, and lust. We are not supposed to be sleepwalking through life. We have a purpose and a goal: To live as a child of God now, so as to live with the Blessed Trinity forever. We are responsible for what we do. Someday Christ will hold us responsible for all our actions. This is why we have to be awake: to be prepared for this judgment. The virtue which keeps us awake is prudence or sound decision making about our actions. The prudent person deliberates, makes a judgment, and then acts. Justice is the standard that prudence uses to make its judgment. Fortitude and temperance help us hold fast to that right judgment. There are four essential habits for human beings which ensure we will always be awake, walking in the light of the Lord, prepared to meet him whenever he should call us to account. They are prudence, justice, fortitude, and temperance. Justice is giving everyone what we owe them, beginning with God. Prudence is the judgment of our reason that an action we going to take will, in fact, be just. The rule or standard of what is just is right reason and the divine law. Temperance is self-control to do what is just when the unjust action seems more pleasant. Fortitude is the will power to do what is just despite fear or pain. God helps us develop these four virtues with his grace. Because we are acting for a supernatural end (to please God) with a supernatural help (grace), these virtues also become supernatural. We cannot be the just person the Scriptures praise without them. We must be awake to whether our actions are just and not fail due to pleasure or pain. Prudence is the human power to think about our actions, determine whether they conform to right reason, and to choose them or not. One very important application of prudence is the daily examination of conscience. In the evening, before we are too tired to think, we stop our other activities and “wake up” by reviewing our day in God’s presence, asking him to help us see what we have and have not done well. We thank God for any good we have been able to do and we ask him to forgive our sins and failings. The examination of conscience prepares us for sacramental confession. By a daily examination of conscience, we get to know ourselves. We really get to know ourselves when we see not only what we have done wrong, but why we have done it. With God’s grace and our effort, we will be able to improve and become more and more that just person who is always ready to give an account. We will more and more become that just person who is, in fact, fit for eternal life.